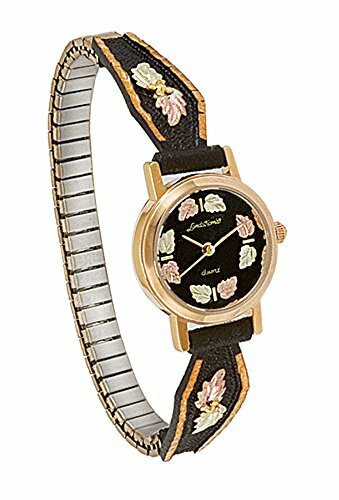 Elegant Black Hills Gold ladies watch with a black dial featuring pair of rose and green leaves at the 12 o clock, 3 o clock, 6 o clock and 9 o clock markers. The Watch band is black powdered to add beauty. Each side of the band has gorgeous black hills gold designs of pink and green 12k Gold leaves. Expansion band is included. Landstroms Original Black Hills Gold Jewelry is manufactured in the Black Hills of South Dakota. Each item comes with a certificate of authenticity and manufacturer's lifetime warranty. If you have any questions about this product by Landstrom's Black Hills Gold Jewelry, contact us by completing and submitting the form below. If you are looking for a specif part number, please include it with your message.